When it's sweater season, it's Silversilk sweater season. Silversilk sweaters are what grown men who favor style prefer more often than not. These fancy style designer sweaters are for the man who knows how to get dressed to impress. 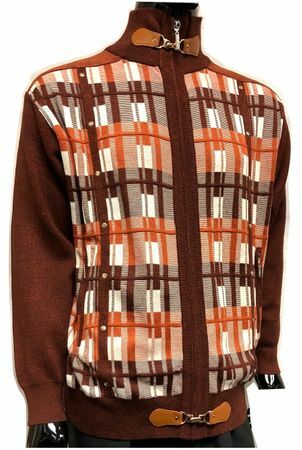 This rich rust looking designer sweater has the looks to get you noticed with it's full zipper style and fancy pattern front. Made of silky rayon knit.